On 22 September 2011, I took part in a panel ”From the Editor’s desk”, convened by Wendy Harcourt and Kees Biekart at the EADI/DSA General Conference in York, UK. The session was conducted as an open discussion among 6 journal editors on the new publishing arrangements with the coming of the digital age among development journals looking at both the opportunities and the current squeeze for resources. When it was my turn to talk, I introduced the KM4D Journal and gave some background on how the journal has developed. It is the youngest journal of them all – then in its 7th volume – and it has, unusually, gone from being an Open Journal System journal to one published by the commercial publisher, Taylor and Francis. After introducing the journal, I very briefly presented some research on development journals that I’ve been doing with Iina Hellsten of the VU University. Iina and I are doing a scientometric analysis of top development journals. As part of this, I presented a few slides showing our preliminary results in which we had considered the institutional and country location of authors of three development journals, based on a sub-set of articles concerned with the Millennium Development Goals (MDGs) for the years 2005-2008: namely World Development, the Journal of Development Studies and Development and Change. This first slide reviews the institutional affiliations of authors. It shows (and I hope you can read it) that these journals are dominated by Northern institutions, both universities and international organisations such as the World Bank and the International Food Policy Research Institute (IFPRI). Of the institutions listed here, only one, namely the University of Delhi, could be described as a Southern institution. Our next slide is concerned with the location of the authors in terms of country. Here, you can see the dominance of authors located in the North, and particularly the USA (green) and the UK (blue). 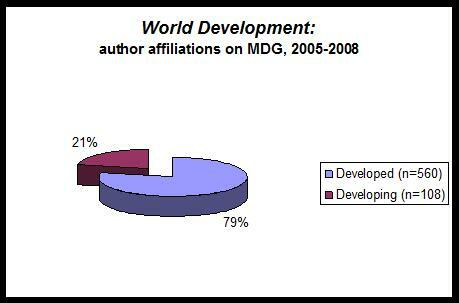 This dominance becomes even clearer when we look at the third and final slide in which the authors for World Development are divided between the developed and developing world. 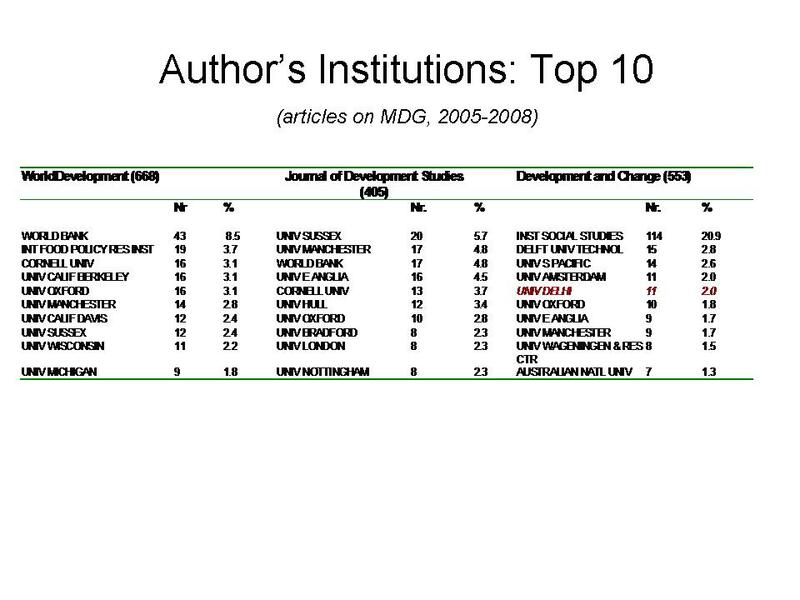 These slides show a reality of development journals being dominated by Northern interests and authors. 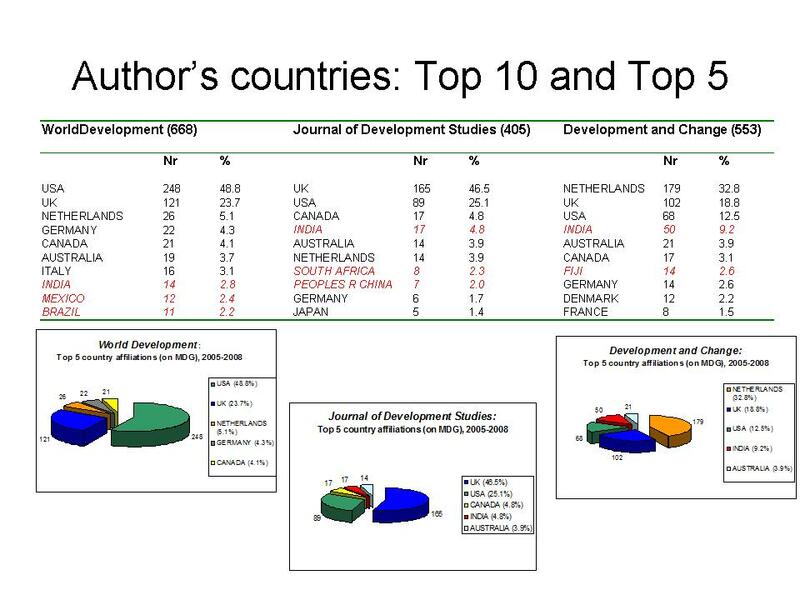 As I then concluded, this picture makes me doubt the role of development journals as being developmental. Not for the first time when I’ve presented these results, I received some angry reactions. One participant argued that this was not a problem because authors in the South have their own journals and didn’t need access to the journals in my study. Another argued that although most of the authors are located in the North, they may well be Southerners, and that this undermined my argument. And that my approach was patronising to Southern academics. But then, fortunately for me, Olivier Sagna of CODESRIA was in the audience. He argued that the difficulty of publishing in international journals was perceived as a huge problem by many African academics. He was also of the opinion that the fact that some of the authors were Southerners based in the North did not change the overall impression of bias. He noted that the brilliance of some Southern scholars was not recognised until they caught international attention by attaining senior positions in the North. When this happened, they found it easy to publish in international journals but before this, they had been just as good but had not been recognised. Please see the full report of the panel, written by Wendy Harcourt.